The average infantry soldier carried approximately 30 pounds of gear into combat. Many carried more. Shown here is the M-1 Garand .30 caliber semi-automatic rifle. 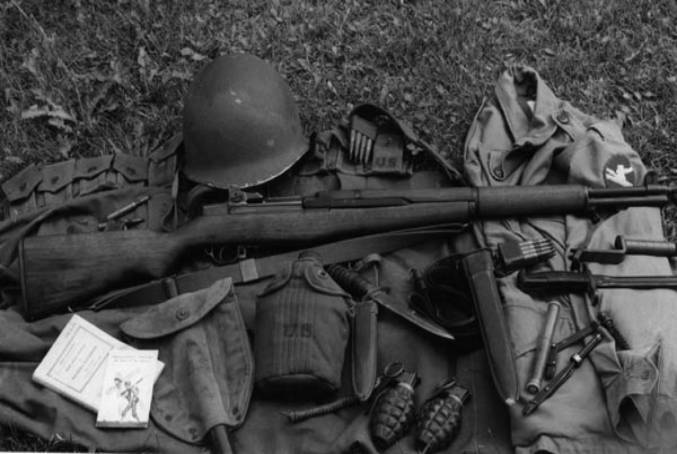 The Garand was the standard issue infantry weapon. It fired an eight round clip of 30-06 ammunition. With each pull of the trigger the rifle would fire and reload another round into the chamber. After all eight rounds were fired the rifle would eject the steel clip with a distinctive ping. The bolt would remain open until another clip was manually inserted into the rifle. 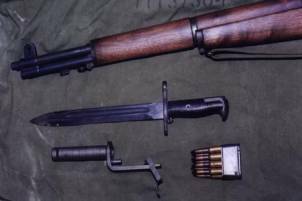 Also shown here is the M-1 bayonet and M-7 grenade launcher which fit later model Garands. The M-7 device allowed the M-1 to utilize a special cartridge to fire rifle grenades. Multiple bandoleers for carrying additional ammunition often supplemented the standard ten clip ammo belt. Also show are typical fragmentation grenades, entrenching tool, and rifle cleaning tools. The smaller knife is a M-3 fighting knife with M-8 scabbard. For more on the M-1 see the Garand Collectors Association (GCA) web site. Detail of the M-1 bayonet and M-7 grenade launcher. The eight round clip contains armor piercing rounds.